A Million Dollar Lake View! Excellent hotel with beautiful bedrooms, it is very clean and cosy. Very kind and professional staff and delicious food. Where to find Lac-Brome hotels near an airport? 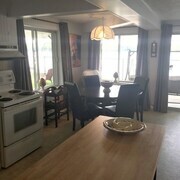 Where can I find hotels in Lac-Brome that are near tourist attractions? 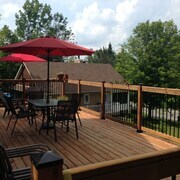 Visiting Eastern Townships and would like to book a hotel in Lac-Brome? Around 11 hotels can be found within a 0.1-kilometre (0.06-mile) radius of Lac-Brome's center. 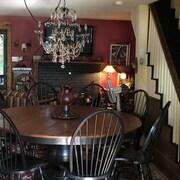 One of only a handful of hotels within walking distance to the center of Lac-Brome, is the B&B Hillhouse. 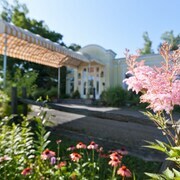 20 kilometres (13 miles) from the main part of Lac-Brome, is the Spa Eastman. 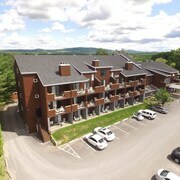 The Le St-Martin Bromont Hotel & Suites can be found 13 kilometres (8 miles) away. You could also choose to book a bed at the St Christophe Hotel & Spa, an Ascend Hotel Collection Member or the Hôtel Château-Bromont. Looking for things to do? Spend the day exploring Venise-en-Quebec Beach and Missisquoi Bay Golf Club, in Venise-en-Quebec, 50 kilometres (30 miles) to the west of Lac-Brome. 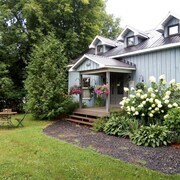 Some of our recommended Venise-en-Quebec hotels and accommodations include the Les Ailes de Lyne and Le Champlain. 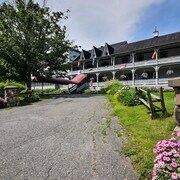 25 kilometres (14 miles) to the northwest of Lac-Brome, you may also choose to stay at Granby, which is home to the Hôtel Castel & Spa Confort and Hotel Econolodge Granby. Whether you're just passing through or staying in Granby, be sure to explore the Granby Zoo and Interpretive Nature Center of Lake Boivin. If you are into sports and love watching games you might decide to take a trip to Olympic Stadium, which is 85 kilometres (53 miles) to the northwest of Lac-Brome. 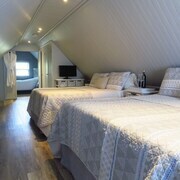 Book accommodation right near the action at the Auberge de La Fontaine or the Loft Hotel. If you are traveling into or out of Plattsburgh International Airport and plan to stay nearby try Comfort Inn And Suites or Holiday Inn Plattsburgh - Adirondack Area. What are the most popular Lac-Brome hotels? Are there hotels in other cities near Lac-Brome? What other types of accommodations are available in Lac-Brome? Explore Lac-Brome with Expedia.ca’s Travel Guides to find the best flights, cars, holiday packages and more!